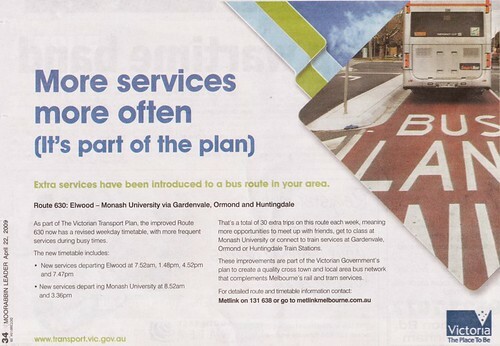 I was thinking the government ads about transport upgrades back in 2009-10 (Labor) are pretty similar to 2014 (Coalition). How would it be if I got them both and dubbed the audio of one over the video of another? 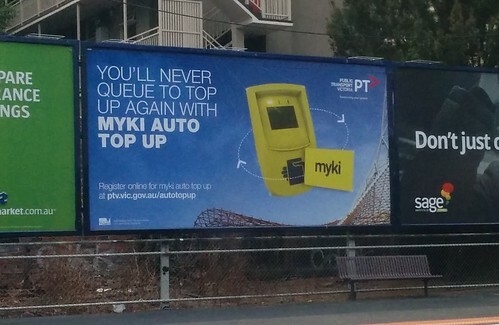 This time around, Channel 7 reports ads like this have cost at least $3.2 million so far. Let’s play a little game of Spot The Difference. Opposition transport spokesman Terry Mulder said the ad campaign should now be considered “electioneering” and withdrawn immediately. He vowed to cut advertising spending in the transport portfolio if the Coalition won government in November. “If I’m the transport minister, the money I have available to me will be going into nuts and bolts business, not self-promotion,” he said. 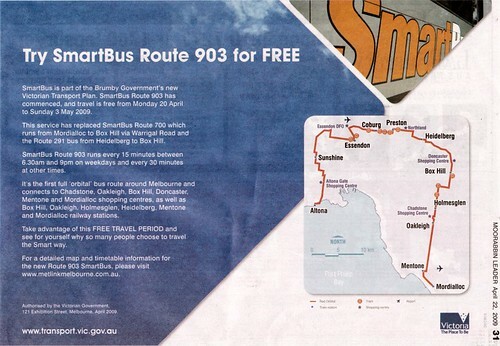 — The Age, 1/9/2010 Rather than invest in public transport Napthine Govt invests in advertising 2 tell us how good it is. But you can’t spin lived experience! Yes, sure it is. Public transport is a product which competes against other modes of travel, particularly cars. But it the ads should be informative, or at the very least should tell you why (even at a high level) you should be using the product. Some of the ads have been informative at some level. From the sample above (and it is only a sample), Labor’s newspaper ads and the Coalition’s billboard/noticeboard ads have some level of useful information in them. 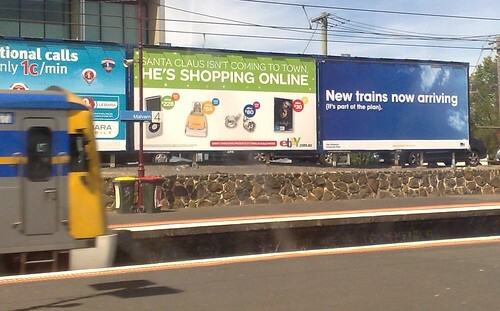 Amazingly, none of the Coalition’s ads spell out a huge improvement they’ve delivered in the last couple of years, but almost totally failed to promote: frequent weekend trains on much of the network. And the TV ads in particular, placed by both sides of politics over the years, tell you very little — they seem purely design to try and convince you that your Government is doing Good Things with your money. 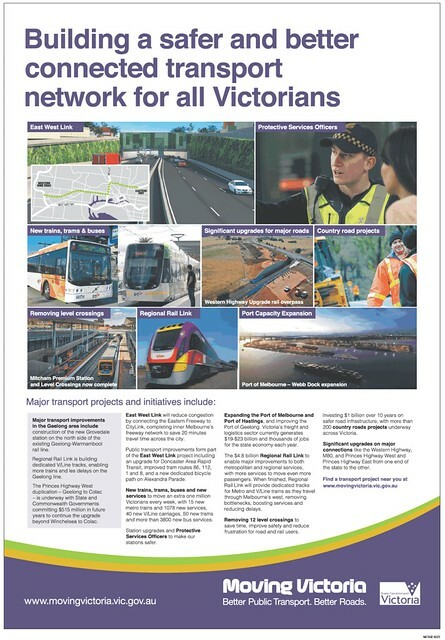 It’s worth noting that from comparing these ads, while the current Coalition campaign promotes a lot of projects that are years away from completion (and in some cases haven’t been fully funded yet), most of the Labor campaign from 2010 focussed on projects which were then at the delivery stage, or at least were fully funded. One thing I really really hate about spammers is how they often insist on the bottom of their email that you’re receiving their crap because you subscribed to it. They know it’s not true. I know it’s not true. Inside it’s clear that the letter is party-political. Stop the boats. 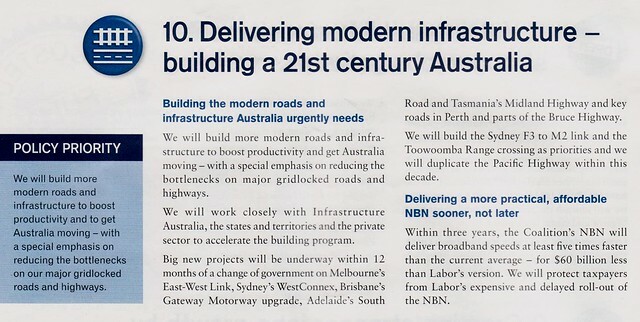 Build more roads (they don’t mention that they specifically refuse to fund public transport). Free you from the carbon tax (you know, the one almost every individual was fully compensated for, and is having the desired effect of cutting carbon emissions). 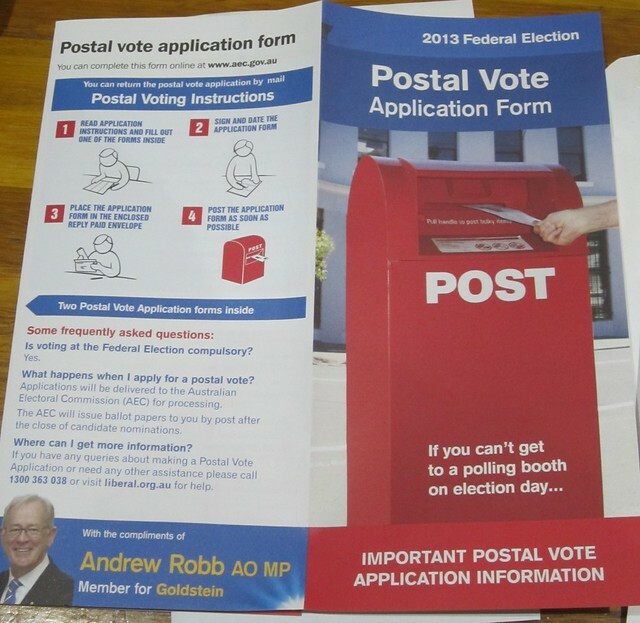 And there’s a “Postal Vote application form”. …As Crikey noted in an article yesterday, it may look like a Postal Vote Application Form, but actually it’s a data-gathering exercise for the party involved. Crikey adds that the information does get sent to the Australian Electoral Commission, but often there can be delays, and there have been cases in the past of forms being stockpiled, and some even get “corrected” along the way by the party. The extra twist of the knife? 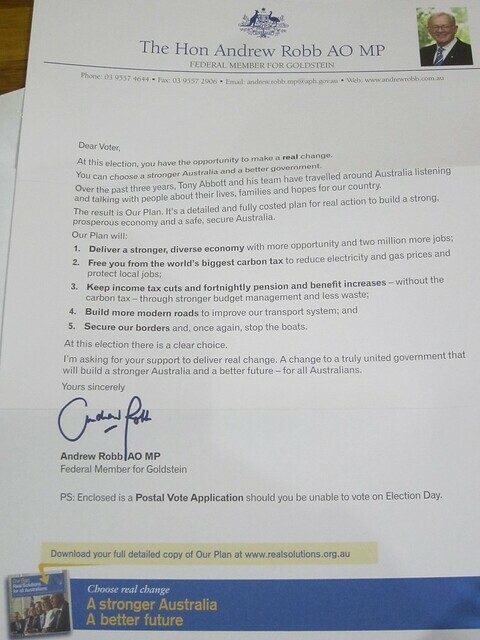 Taxpayers/voters are actually paying for these letters. The Liberals aren’t alone in doing this. Tens of thousands of people use these forms, via various parties. Don’t be fooled. 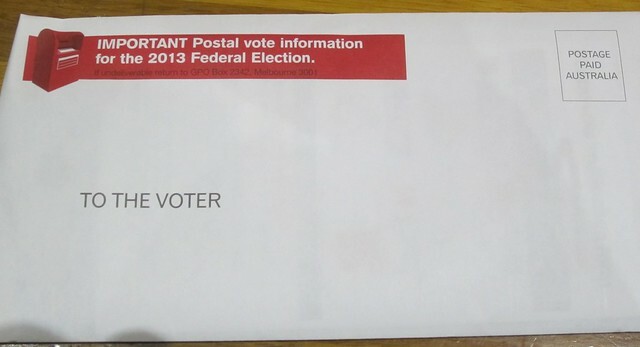 If you want to apply for a Postal Vote, do it via the AEC. 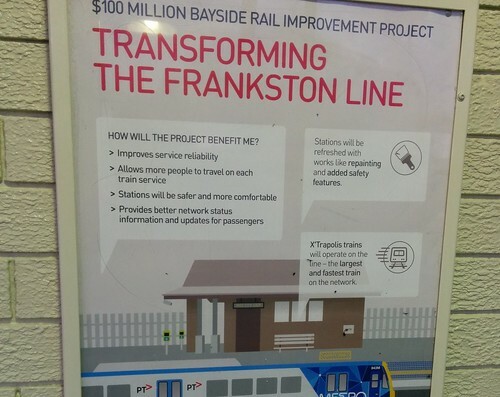 If Abbott’s Coalition won’t build rail, why does their policy document include a rail icon? 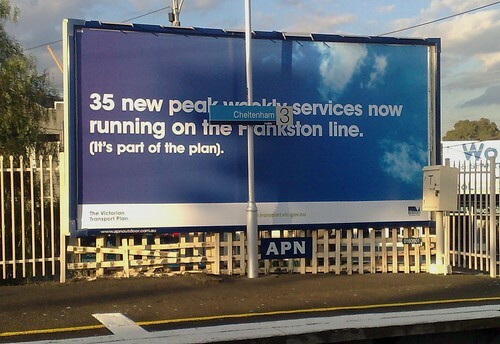 If Tony Abbott’s Coalition won’t build rail, why do they include a rail icon on their infrastructure policy? At least, I’m assuming it’s an icon for rail — not giant white picket fences to keep out asylum seekers, or something like that. (The above is from the summarised version. The slightly more detailed policy document is here). True, they’ve specified they won’t build urban rail, but it seems pretty clear their plan is to build lots of roads, and no rail at all. In fact, their plan proposes a frenzy of motorway construction right across the country. Truly a pave-the-planet scenario: Melbourne East-West Link, multiple projects in Sydney, Brisbane Gateway Motorway, Adelaide South Road, Tasmania Midland Highway, and a bunch in Perth. One can only conclude that they really believe that — unlike every other major urban road project in history — this massive road expansion will somehow solve traffic problems. Unfortunately this kind of popularist, car-oriented thinking misses is the point that transport is supply-driven. Traffic demand grows to fill the available capacity. When it comes down to it, this means if you want more people to drive, building more roads is the way to do it. If you want more people to use public transport, provide more of that instead. If elected, Mr Abbott will fund more roads, which will fill with more traffic — further undermining sustainable transport modes, not the least by starving them of billions of dollars of funding for years. Wonderful. A few thoughts on Federal politics from the last few days. I think Gillard did some great stuff. Carbon tax (some don’t like it, but it works), National Disability Insurance Scheme, the Royal Commission into child abuse, and (along with her predecessors on both sides) keeping the economy afloat in dire economic times — and all while dealing with the challenges of a minority government, making it difficult to get anything done at all. But for whatever reason (probably a combination of sexism and problems of running a minority government), she had zero chance of winning the next election for Labor. Rudd is apparently a control-freak and difficult to work with, but has a small chance of winning. Small is greater than zero. And even if Labor can’t win, it’s better to have an Opposition that works than an Opposition that’s been almost totally destroyed. Why is this important? Because the Coalition under Abbott is regressive on key points. For me, the two biggest are that they won’t fund urban public transport, only roads; and they will abolish the carbon tax even though it works. And of course there’s Abbott’s half-baked (but most of the cost) version of the National Broadband Network — completely lacking in the vision to see the types of emerging IT-based industries that could help drive the next economic boom, as well as bring benefits right across the country, especially in regional areas, such as much better (remote) access to medical services and advice. One more thing: Abbott and others are criticising Rudd because he wasn’t elected by voters to be leaders. Abbott didn’t have such criticisms when Napthine took over from Baillieu in Victoria. Reality is, us voters don’t directly elect leaders. Both Rudd and Napthine are legitimately leaders. 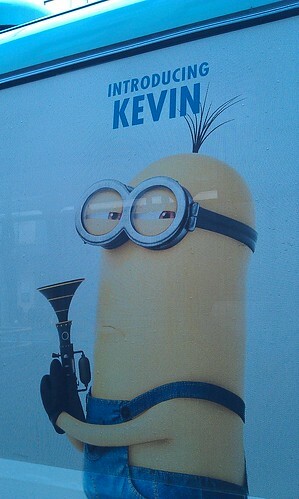 Update 29/6: Added picture of ad for “Despicable Me” that I saw on the side of a bus earlier in the week. The way the state budget has been framed in terms of transport was almost inevitable: the East-West motorway (stage 1) vs the Metro Rail Tunnel, with the motorway winning this round. While they are quite different projects, serving (mostly) different markets and (attempting to be) solving different problems, I thought it might be interesting to look at them side-by-side them, based on known facts and some slightly shaky estimates, and using some doubtful metrics to compare. As I said, they are different projects serving different markets, and probably shouldn’t be directly compared like this. But there are some points to be made by doing so. For both, reaching the theoretical capacity depends on removing other bottlenecks, and making sure feeder routes (whether PT or road) are completely optimised. But if you can do it, even the huge cost of underground rail is still many many times cheaper for the capacity brought than underground roads. The government is talking of the road in terms of “city-shaping”. The problem is it’s city-shaping towards more car dependence, with all its problems and inefficiencies. As some have pointed out, the Eastern Freeway already gets clogged in the Box Hill area — inducing more traffic (motorists heading west from Clifton Hill) is not going to help this; nor is it going to help motorists heading south down Hoddle Street towards the inner-city. If they were serious about ensuring the efficient movement of the city’s growing population, they’d be investing heavily in the most efficient mode, and helping more people get around more often leaving the car at home (or even ditching one of the cars in their household). That would be city-shaping, in a good way. 9am: updated with higher $9b rail tunnel cost estimate.